Nokia has decided to try their hand at a green phone (eh..... this is getting boring huh??). Although this is still a concept design, I guess the fact that they are trying their hand at it even is a good sign (especially in these globally warm days). But here's the twist.... This phone doesn't promise safe disposal or eco-friendly usage. Here's the "green" part. The phone’s outer shell is created from old metal cans through a process of upcycling. The gaskets and the backing for the numeric keypad are made from car tires, while all the plastic components are made of recycled PET bottles. Oh yeah... so now you know where your recycled Coke bottle and that Dunlop you'd given away goes!! This has to be the awesomest geek wedding cake ever!! 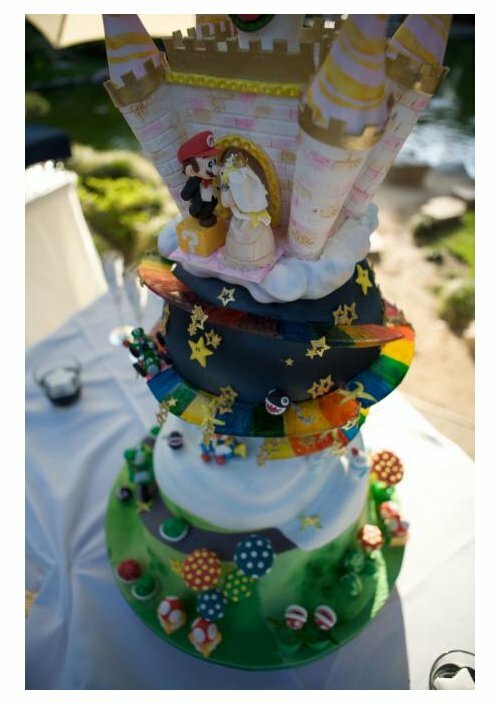 It was a Flickr user's wedding cake, and it seems to have everything in the Mario world represented nicely. It’s got Toad, Yoshi, Piranha plants, mushrooms, even the Chain Chomp guy. The castle on a planet was inspired from Super Mario Galaxy. The cake was created by Beth from Let Them Eat Cake in California. Ever wondered why people never divorce with such style?? They should. You’re getting the hell away from each other after all which, according to me, is cause to celebrate!! Marry with a Mario cake and divorce with a Zelda cake, that’s what I say. Or how about a Tetris cake, that can be thrown at each other. Pure fun huh?? Go Geeks!! Desi Tech Giants Infosys has done it again!! Now they have been granted the patent to produce holographic mobile handsets capable of projecting, capturing, and sending 3D images. In a press release, they have claimed that by 2010, the patented devices will be capable of beaming 3D films, games, and virtual goods into our laps. These cellphones will capture and send 3D snapshots of the surrounding world, helping accident investigators, teachers, and doctors work remotely by instantly relaying realistic depictions of car damage, injuries, medical scans, or educational aids. The device will work on a revolutionary technique with a powerful on-board processor building a series of 2D shots,from a secondary device like from a digital camera, and then convert these into 3D holograms using algorithms called Fourier transforms to artificially generate the extra third dimension. I'll write about Fourier Transforms ( if possible) in the coming week!! The patent, which was granted by the U.S. Patent and Trademark Office, allows Infy to squeeze complex 3D holographic images through the narrow pipes of existing communications networks by sending only the unprocessed data to be translated into the 3D hologram at the other end. The global 3D screen market is forecast by the industry to grow to 8.1 million units by 2010. Well I only hope that Infy is calculating time as per IST (Indian Standard Time) and not IST (Indian Stretchable Time)!! In one of the best online gags that I have come across in the last few months, especially at this time, with Yahoo! 's top execs quitting, someone seems to be having some fun at Yahoo! 's expense. Planning on quitting Yahoo!?? Simply visit the newly created site Yahoorezinr.com and fill up the "DIY Yahoo! Resignation Letter" which provides you options in the form of drop down menus and you're done. Yahoo! employees can expedite their resignation to Yahoo! Chief and Co-founder Jerry Yang with a host of "Mad Libs"-style pull-down menus. For example, one sentence reads: "My last day here will be two weeks from today/ tomorrow/ the best day of my life you f@$#ing incompetent nincompoops" . All you have to do is select the most appropriate choices for your resignation letter. Then upon clicking submit, your default email editor opens up with the subject " Get bent a$$hat" and the to email id "JerryYang@Yahoo.com"
Some points in the letter are obvious hyperbole. In one of the menu options, the letter suggests that Yahoo doesn't understand how to run a taco truck, much less a $30 billion business. The rants may reach Yang himself, but that's unclear, too. The form letter is addressed to JerryYang @Yahoo.com which frankly I cannot confirm is Mr. Yang's id!! Anyways, disgruntled employee or a competitor having a laugh at Yahoo! 's cost, this tool is a must try....Give it a go!! Great news for GMaps fans!! 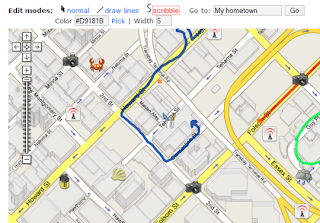 You can now use a simple plugin to doodle on Google maps and share your doodles with friends with a single click!! When Google launched the MyMaps feature last year, many people criticized the fact that you couldn't actually customise maps. For ex. to show someone in school the way to your home, or the way to that uber-cool club from your workplace. While google has done a great job adding a directory of special layers, the tools for creating your own maps have not seen that same advancement. To answer that call Quikmaps, a third party tool that plugs into the Google Maps data, is a far simpler solution letting you simply doodle on the map. I doubted the power of this tool but once i started using it, I simply fell in love with it!! In most cases this plugin is a breeze to use and is much more understandable than Google's straight line tool The best part is that the results will scale when you zoom in and out. However you cannot measure the distance between two points using this plugin. Map creations can be embedded, which you can see below, and can be shared via email or with a simple URL. Go ahead....try it and I'm sure you'll never stop!! A computer model has suggested that an icy, unknown world might exist in the distant reaches of our solar system beyond the orbit of Pluto!! The hidden world is predicted to be much bigger than Pluto by on the model and its existance would satisfy the long-held hopes for a "Planet X" envisioned by scientists and sci-fi fans alike. This Planet X could also explain unusual features of the Kuiper Belt, a region of space beyond Neptune littered with icy and rocky bodies. The computer model was created by Lykawka and Tadashi Mukai, from the Kobe University. The Model has been described in a recent issue of Astrophysical Journal. 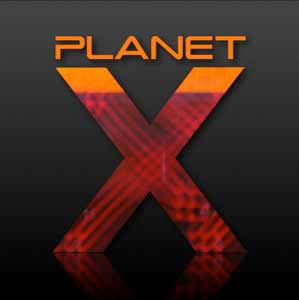 If this Planet X is confirmed, it would technically not be a planet, but a plutoid. Read This Older Post to understand why!! Under IAU definitions, the new world will be the largest known plutoid!! The Kuiper belt has always wed astrophysicists with its myterious characteristics. For example Sedna, a rocky object located three times farther from the sun than Pluto. Sedna takes 12,000 years to travel once around the Sun, and its orbit ranges from 80 to 100 astronomical units (AU). Obviously, now the question rises, can this planet X support life?? Well, frankly, at that distance, any surface water completely frozen. However a subsurface oceans (like those suspected to exist on some planetary moons) may exist. We are still scratching the edges of that region of the solar system, and I expect many surprises await us with the future deeper surveys --Mark Sykes, director of the Planetary Science Institute, Arizona. 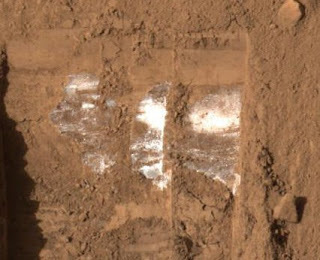 Pictures of the "White Substance"
In NASA's words: "NASA's Phoenix Mars Mission generated an unusually high volume of spacecraft housekeeping data on Tuesday causing the loss of some non-critical science data.Phoenix engineers are analyzing why this anomaly occurred. 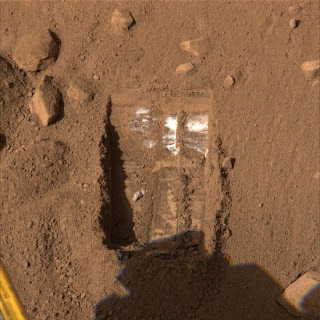 The science team is planning spacecraft activities for Thursday that will not rely on Phoenix storing science data overnight but will make use of multiple communication relays to gain extra data quantity"
Hopefully, all problems will be sorted out soon!! OK, maybe this is a little exaggerated, just a little, but this may soon be true!! A Chinese company has developed a prototype UFO-like aircraft capable of flying at an altitude of around 1,000 meters with speed up to 80 Kmph!! 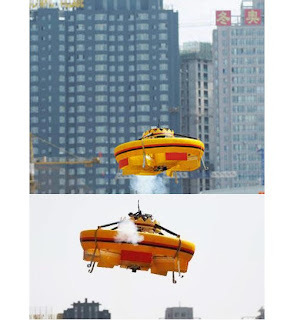 The disc-shaped craft, developed by Harbin Smart Special Aerocraft Co Ltd, is 1.2 meters in diameter and weighs 10 kilograms. It is pretty obviously unmanned and uses a single propeller. It can take off and land vertically and hover in the air. Amazingly, it is environment friendly and uses methanol for fuel!! The scientists at the HSSA Co Ltd, say that it took around 12 years and around $4 million to develop the aircraft which can be used for aerial photography, geological surveys and emergency illumination. Here's a question for you.... How many songs do you think an average teen has on his iPod?? And what percentage of those tracks are pirated?? A recent study has answered these questions and the results are shocking!! 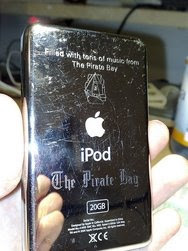 The survey, conducted on iPod owners in the age group of 14-24, by the British Music Rights has shown that over 50% the average 1770 tracks on an MP3 player pirated ones.It also revealed that 95 % of teenagers and young people copy music in some way or the other.....Illegally!! This means that an average owner keeps £750 (Roughly Rs. 60000!!) worth of copied music on their iPods!! 42 % allow P2P users to upload from their own computers. 60 % of the surveyed audience said they would carry on buying original CDs. 80 % of current P2P users said that they would be interested in a legal file-sharing service, and would even be willing to pay for downloading legal tracks. 71 thousand jobs are also lost every year due to music piracy. And with the advent of newer, better software with extended search capabilities like Vuze, it seems that this number will only rise over the next few years. If you've heard P2P then you've most probably heard of Azureus, one of the most popular torrent client available. Now Azureus has changed its name to Vuze. Along with the name, Azureus has also filled up its trunk with some new and nifty social-networking features in its latest upgrade (version 3.1). The name Vuze, has been adopted from the name of a desktop video player that was launched last year. The new client bundles the player and torrent-client together and binds them with some new features. Vuze 3.1 features a search engine which users can use to spider across multiple torrent-tracking Web sites such as MiniNova, SuprNova or The Pirate Bay while looking for content. Other new features included in Vuze 3.1 are the social networking features. These features let you share your favorite torrents directly with friends and create profiles. One grouse is that chatting haven't been introduced in this release. However Vuze has maintained itself Open-source. Azureus has had a rough patch over the past few months, especially with the introduction of plug-ins that track statistics on ISP throttling behavior. It seems like the merge was one of the few options it had left. Being a Azureus user in the past, I felt pretty much at home with the new Vuze... However I can't really say how many Azureus users will readily jump to Vuze. Guess we'll just have to wait and watch. Just a list I stumbled upon!! might help you if you've just completed your 10+2 or are planning to pursue your higher education in India..... please note, this list is not my personal opinion!! Coll. of Engg, Anna Univ. Do you agree with this list? ?